Going to Turkey, do not forget to visit the archaeological site of Ephesus because there you will find a Grand Theatre or Aspendos Theatre. That said, the scenery is as dramatic and impressive at that site. Being here, you will feel dwarfed. Built into the base of the north Panayirdag (Mount Pion), Grand Theatre has a height of 30 meters and can accommodate 25,000 people. Moment might be imagined in your mind how the people at that time to make this spectacular masterpiece. Being at the top of the theater, you will find beautiful scenery of the green and the ruins of Ephesus archaeological site. This is an opportunity not to be missed when visiting. Tracing the story of the history, construction of the Great Theatre of Ephesus may have been started from the Hellenistic period by Lysimachus (d.281 BC), a successor to Alexander the Great. Lysimachus is traditionally credited with the theater. However, so far no archaeological evidence for the existence prior to 100 BC. Estimated Lysimachus may choose the location of development and begin preparation of site development, a process which takes 60 years of excavations in the mountains. 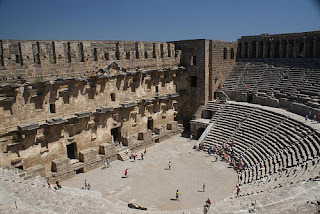 Alternatively, a small Hellenistic theater ever built here around 200 BC, but the theater is now seen almost exclusively derived from the Roman era. Built primarily on the century-1 (starts around 40 AD), which was later extended on a regular basis and used continuously until the 5th century. During the passage of time, the theater was once destroyed by the earthquake in the 4th century, after which only partially repaired. 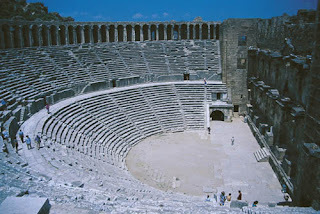 On the 8th century, the theater was put into the defense system of the city. Today, the theater was restored and preserved for later use during the festival every May Ephesus Selcuk art and culture.